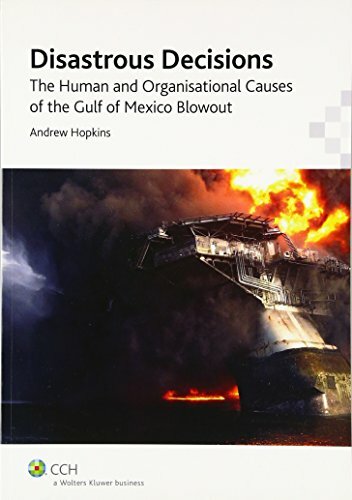 Disastrous Decisions: The Human and Organisational Causes of the Gulf of Mexico Blowout takes the reader into the realm of human and organisational factors that contributed to the Deepwater Horizon disaster in 2010. This event resulted in the loss of 11 lives in the explosions and fire, the sinking of the rig and untold damage to the environment and to the livelihood of Gulf residents. It is important to know what people did, but even more important to know why they did it, so this book attempts to "get inside the heads" of decision-makers and understand how they themselves understood the situations they were in. It also seeks to discover what it was in their organisational environment that encouraged them to think and act as they did. Professor Andrew Hopkins is an internationally-renowned presenter, author and consultant in the field of industrial safety and accident analysis. Professor Hopkins has been awarded a prize by the European Process Safety Centre for "extraordinary contribution to process safety", the first time this has been awarded outside of Europe. Professor Hopkins has been involved in various government occupational health and safety (OHS) reviews and completed consultancy work for major companies in the resources sector, as well as speaking regularly to audiences around the world about the causes of major accidents. He delivers presentations to organizations both within and outside Australia, and the topics include the BP Texas City Refinery Disaster, Mindful Leadership, Lessons from Longford (on the Esso Gas Plant Explosion) and Safe Behaviour Programs. He is a recipient of the 2008 EPSC Process Safety award. Professor Hopkins was an expert witness at the Royal Commission into the causes of the Esso's gas plant at Longford in Victoria in 1998. More recently he was a consultant to the U.S. Chemical Safety and Hazard Investigation Board (CSB) during its investigation into the 2005 explosion at BP's Texas City Refinery and was an expert commentator in the CSB film about the disaster.